On an unassuming corner in the Mile End district of Montreal sits an institution called Wilensky’s Light Lunch. 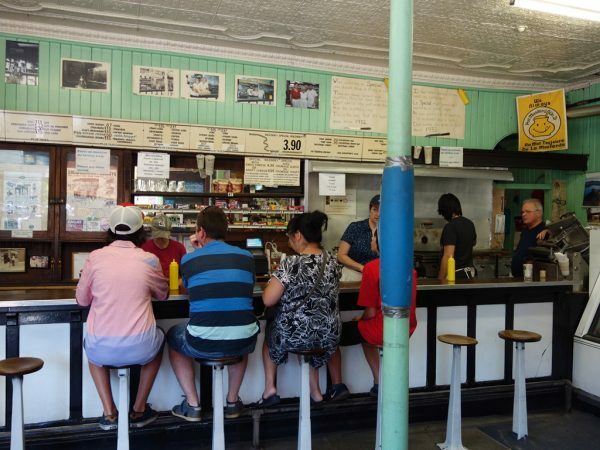 Famed for a sandwich called the Wilensky Special (more on that in just a minute), Wilensky’s has a history worth revisiting. 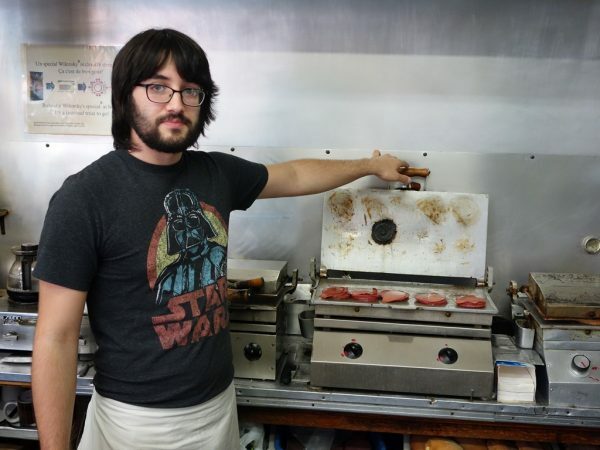 Moe Wilensky opened the shop in 1932, then moved it twenty years later to its current location in a Jewish neighborhood, just a block from the infamous Fairmount Bagel. 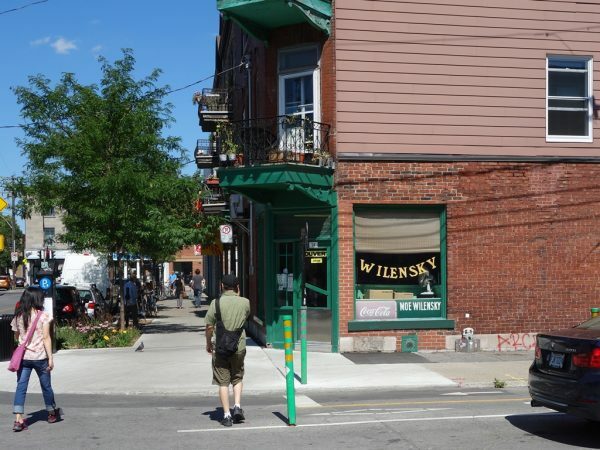 The shop has been in the spotlight before, appearing in Mordecai Richler’s novel The Apprenticeship of Duddy Kravitz and later serving as the location of some scenes in the movie version starring Richard Dreyfuss. This corner store sold cigars, books, dry goods, hot dogs, and haircuts, with the luncheonette counter becoming especially popular after the purchase of some special grills. From the “they don’t make them like they used to” department, I’m told those same grills are still in use today, some 80 years later, and reliable as ever. There are a few items available for lunch (like a spicy Jewish sausage called karnatzel), but virtually everyone gets the Wilensky Special. It’s a sandwich of all-beef salami and all-beef bologna on a Kaiser-like roll that’s pressed flat on a grill similar to a Cuban plancha, giving the bread a crunchy texture. You can get the Special with or without cheese (choice of Swiss or Kraft), rounding out your meal with pickles and perhaps a fountain drink that’s still mixed by hand, the old-fashioned way. Cherry cola is the most popular choice, but there’s also chocolate, lemon-lime, and pineapple—or any combination of the four. Wilensky’s does have rules, with signs explaining them. First, there’s no option of omitting mustard. It’s just the way it’s always been done. Second, you can’t have your sandwich cut. Finally, pay when you’re served (which happens in lightning speed), and don’t tip. Don’t worry, though, should you forget: if you do leave money on the counter, it’s donated to the Heart and Stroke Foundation. The sandwich itself isn’t a revelaton (the texture is my favorite part), but $3.90 for the Special (or $4.34 with cheese) is a small price to pay for a chance to experience living history. The shop is like a museum, with its old grills, cash register, refrigerator, and more to be found under the pressed tin ceiling. 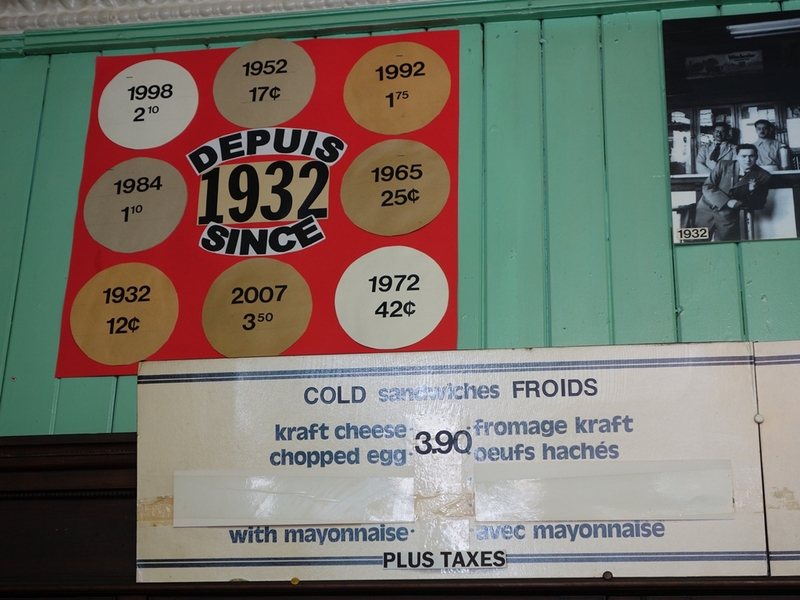 A sign depicts a timeline of the sandwich prices since the 1932 opening. 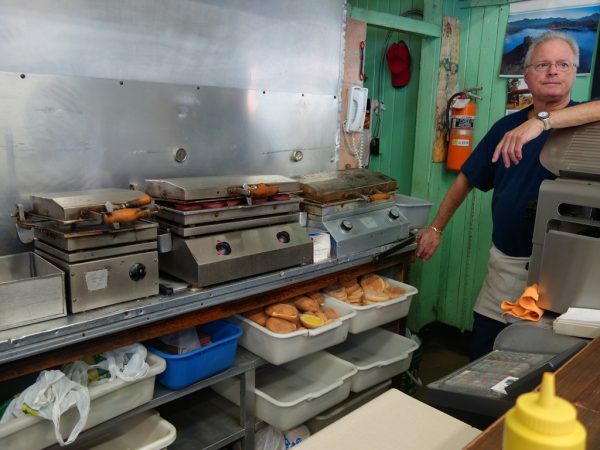 And when you sit on one of the nine stools at the counter, you get a chance to talk with Wilensky family members who are simply going about their business. You might even find Moe’s widow Ruth, now 93 years old, standing behind the counter, ready to serve you a sandwich and share a tidbit of history. 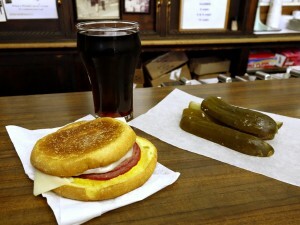 I ordered a Wilensky Special with cheese, sour pickles (half-sour are available), and a cherry cola made right before my eyes. Wilensky’s is a true luncheonette, with seating only at the nine stools at the counter. Because service is so fast, the seats tend to turn quickly. The Wilensky’s Special has bologna and salami (both all-beef) ready to roll, part of the reason why sandwich orders are so speedy. Another non-family member (but devoted employee) at the grill. The source of the buns is a secret, but their crunchy texture post-grilling is surely a key to Wilensky’s success. 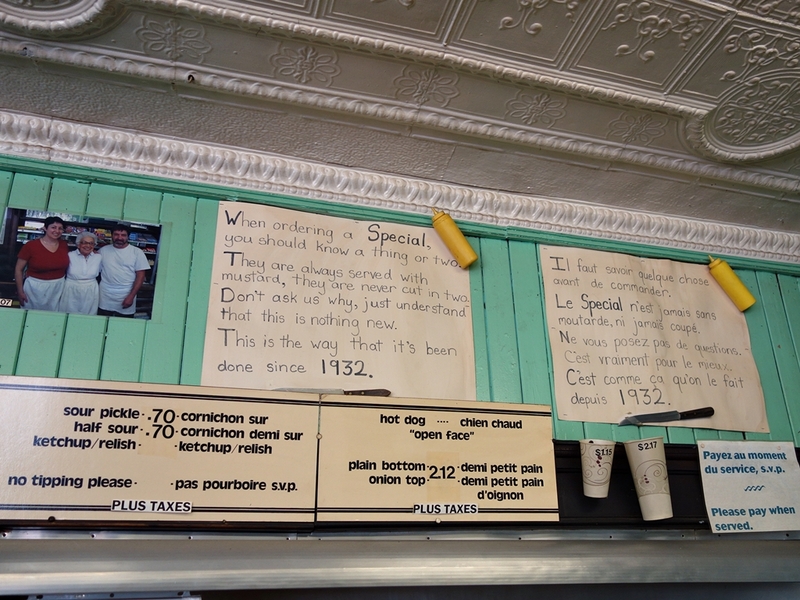 Signs in English and French explain why mustard is a must at Wilensky’s. I like how the policy streamlines service. This board shows how pricing of sandwiches has progressed since the shop opened in 1932. 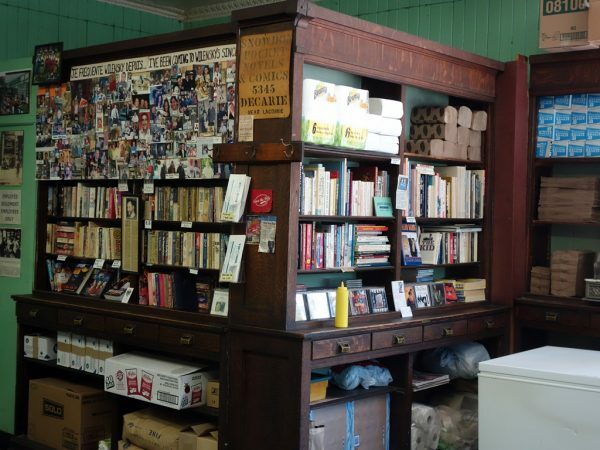 It’s worth exploring all the shelves and space at Wilensky’s. The corner store has always sold dry goods and more, and these bookcases had some interesting reads.